It’s a good metaphor for two opposing heavyweights in the philosophy of ethics, which are also ideas explored many times by the show during its run: consequentialism and deontology. 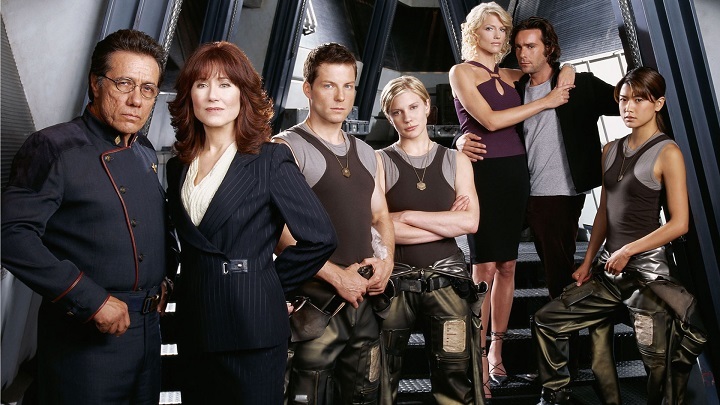 This post will explore what they mean, why they’re important, and how the battle between them encapsulates the moral philosophy of Battlestar. Put simply, consequentialism holds that the ends justify the means. In other words we should judge the morality of an action solely by its consequences. On the other hand, deontology holds that what is important is the nature of actions themselves. Some cannot be justified no matter how good their consequences. So we should judge the morality of an action based on certain rules or obligations. Often when novice philosophy students learn about the basics of moral philosophy, their gut reaction is to side with consequentialism. “Of course it’s the outcome that should matter, never mind a bunch of arbitrary rules!” But many of us depend on such rules to live our day-to-day lives. For example, most of us would find it very hard to kill another human being, even if it were necessary for the greater good. This is thanks to the deonotological rule drilled into us at a very early age that it is wrong, or against the rules, to kill a fellow human. We should never experiment on embryos, despite the many scientific discoveries this could bring about. We should never torture people, despite the incredibly useful information we could gather. We should never maintain weapons of mass destruction, despite their usefulness as a deterrent. A runaway trolley (not the shopping variety) is racing down a set of railway tracks. Five helpless people are tied to the tracks straight ahead of the trolley. You are standing next to a lever that will allow you to switch the tracks and change the trolley’s course before it hits the five. However, there is a single person tied to these alternate tracks. Do you do nothing, allowing the trolley to kill the five people? Or do you pull the lever and divert the trolley so it kills the one person? 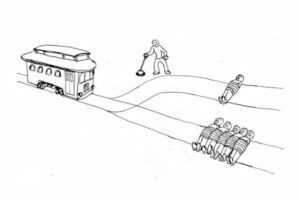 Consequentialism says that we should absolutely pull the lever to save four innocent lives. This is the best outcome of the two options we are presented. But a deontologist, depending on the specific moral rules they subscribe to, could argue that to pull the lever amounts to murder and cannot be morally defended — no matter the outcome. A version of the trolley problem is explored in the very first episode of Battlestar Galactica. The survivors of the human race flee their devastated planets, pursued relentlessly by the Cylons, the robotic (or not so robotic) race they created to serve them but who are now hell-bent on wiping their creators from the face of the galaxy. In the chaos one of the human ships — with over 1,000 civilians aboard — is accidentally separated from the rest of the fleet. Hours later it reappears, with the Cylons in close pursuit. The human leaders believe there is a chance the ship has been infiltrated by the Cylons and that it poses a serious threat to the safety of the entire fleet. They must decide whether to destroy the ship and sacrifice 1,000 lives for the greater good, to ensure that just under 50,000 remaining humans have a shot at survival. President Laura Roslin, the leader of what remains of humanity, struggles with this choice. Finally she decides that the risk and potential consequences of infiltration are too great. She orders the ship, and everyone on board, to be destroyed. Her orders are carried out. A thousand lives are cut short to guarantee the survival of the human race. In fact the show was forced by its network to dilute the power of this choice. When the pilots fly past the ship before destroying it, no people are seen through its windows. It’s unclear whether or not there are still humans aboard. Regardless, the leaders of humanity were willing to sacrifice a minority of their own in order to increase the odds of the survivors. It’s a dilemma they are forced to dwell on many more times in many different scenarios over the course of the show. President Roslin is one of the most interesting characters in Battlestar, precisely because she struggles continually with these kinds of tough decisions. She wars between two sides of herself: the side that wants to do whatever is necessary for the greater good, and the side that wants to do what her heart tells her is right. Throughout the show she veers between utter ruthlessness and deep compassion, depending on the circumstance. She lies to the parents to a newborn Cylon-human hybrid and tells them their baby girl has died, so that the child can be raised by a surrogate mother and kept safe away from prying eyes. She determines that Gaius Baltar, widely regarded as a political traitor and responsible for thousands of human deaths, deserves a fair trial rather than being thrown out of the airlock and left to rot in space. Roslin is a deeply human and deeply complex character. She illustrates the fine mental dance between deontology and consequentialism that is a recurring element of moral being. She wrestles with the questions we’re all forced to ask ourselves at one point or another, and which dictate the way we live our lives: how far are we willing to go for the “greater good”? What is the boundary past which we cannot pass, not matter the outcome? When does doing that which is difficult but necessary become less optimal than the consequences of standing aside and doing nothing? After all, this is a president who chooses to rig an election to ensure her victory, after becoming convinced that the triumph of her opponent can only lead to death and destruction for mankind. (She’s right: her opponent is Mr Baltar, and his presidency does end in tragedy.) She does this despite her own disgust at betraying the very democracy she represents. The likely outcome of her loss is too terrible to be permitted, and so rigging the vote is a crime Roslin forces herself to bear. The president must decide her own line in the sand, her own immovable moral rules. And she must do so with the highest of stakes imaginable — the survival of the human race. Perhaps the starkest example of this is Roslin’s stance on abortion in the fleet. Once humanity is allowed some respite from the initial Cylon attacks, they must decide how their society is to continue now that they’re fleeing in search of a new planet to call home. Roslin herself begins as a fairly liberal Secretary of Education. But after the Cylon invasion, and her unexpected promotion to president, she is forced to take a harder stance on issues now vital to mankind’s future. Ultimately she decides that she cannot allow a single life to be lost when there are fewer than 50,000 humans left in the universe. With a heavy heart, she declares all abortions illegal for the foreseeable future. Her theoretical beliefs come to clash with the harsh practicalities of trying to save a doomed race. Her standard moral rules are broken in the face of such dire consequences. So we see how President Roslin picks out her own path between consequentialism and deotology. Under such circumstances, it’s admirable that she often tries to weigh up the best possible outcome for the scenarios she is faced with, rather than just defaulting to her own moral beliefs. A common complaint against consequentialism is that it asks too much of us. That is, it’s unreasonable for a single person to be expected to work out the potential outcomes of every possible action and the probabilities of each, to say nothing of how these branching options might have further impact moving into the future, and then chose the action which will bring about the best possible consequences. It’s not only impossible to be 100% accurate; it’s time-intensive and difficult in the situations where this method can be desired most, such as the pressures of war. This is of course why soldiers are taught not to think in the heat of battle, but rather to follow simple rules and commands which are drilled into them and which generally bring about the best outcomes as a matter of fact. Follow the orders of your superior. Stay in cover. Move to higher ground. It’s just simpler for us humans, who are not omniscient but are quickly overwhelmed. Perhaps a supercomputer could execute the complex equations needed for true, constant consequentialism, but not humans. This is also why most of us follow unconscious but ingrained moral rules for the simple choices in our day-to-day lives. Generally these rules lead to good things happening, and they save us a lot of unnecessary mental exertion. We don’t lie. We don’t steal. We show interest in other people’s lives, even if we couldn’t care less. Often it’s only for the big decisions that we feel the weight of potential actions and consequences pressing down on us. Returning to Battlestar, it’s easy to understand the pressure Roslin must feel to carefully consider each of her choices. In a time when every decision counts, consequentialism becomes king. The normal rules, which usually bring about the best consequences, simply aren’t good enough when the status quo has been turned on its head. A true consequentialist would say that, regardless of difficulty, it is the duty of a moral person — particularly one in a position of supreme power — to weigh up their choices and make the ones they believe will lead to the best outcomes. And this is what Laura Roslin so frequently takes it upon herself to do. 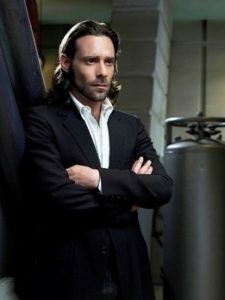 Let’s step away from Roslin for a moment to another intriguing character in the show: Gaius Baltar. A brilliant but self-obsessed scientist who eventually turns to politics, he is often shown as a dramatic foil to Roslin. Morally he is introduced as a consequentialist, but of a specific type. Baltar is a moral egoist. He almost always takes actions that lead to the best consequences — but only the best consequences for him. Everything he does is for his own benefit, including implicating innocent people in crimes they did not commit and accusing them of being Cylons to save himself from scrutiny. As the show progresses Baltar’s guilt seems to catch up with him. He shows more and more overt regret for his actions, and later turns to religion to help guide him. Most religions follow deontological moral principles (think of the Ten Commandments), and Baltar’s chosen faith, the religion of the Cylons, is no different. On the surface he begins to adhere to rules of giving to those in need and providing hope to the hopeless. But Baltar is still a complex and contradictory character. His helpless egoism seems to simmer underneath everything he does. Thanks to his religion and its rules, he creates a spiritual persona for himself that generates a cult of civilians who worship and dote on him. Even his selfless acts end up helping him in the end. Baltar certainly uses the principles of consequentialism for selfish means, but it can be argued that he abuses deontology in the same way. In fact Baltar’s practical blending of consequentialism and deontology illustrates a way that many of us merge the two moral approaches in our own lives. As we’ve seen, it can be too effortful to calculate the consequences of each of our actions before we take them — and it can be too tempting for us to take actions that will only benefit ourselves. But generally most of us do want to try and bring about the best outcomes, for everyone affected, whenever possible. This why we follow set deontological rules that generally tend to lead to the best consequentialist results. As young children we learn that most times being nice to other people leads to good things for both us and those we interact with. So we come to trust this rule and follow it regularly through our lives. It’s only the big, life-changing decisions when rules cannot always be trusted and we’re forced to make consequentialist calculations. This way we can be confident of always trying to bring about the best consequences for ourselves and others, while being permitted to fall back on certain simple moral rules that are generally accepted to lead to those good outcomes. It’s an elegant approach with power and flexibility, one that almost all of us follow without realising. So, just like humans and Cylons, deontology and consequentialism are more alike than we first imaged. We moral beings walk the fuzzy but practical line between the two. Though we’ve seen that many of us instinctively support consequentialism as a concept — the idea of always trying to bring about the best outcomes possible — we haven’t yet considered what those “best outcomes” actually consist of. In the case of Gaius Baltar, these outcomes are defined as the best consequences for himself as an individual. For Laura Roslin, these outcomes add up to the continued survival of the human race. At the brink of extinction, what is humanity still fighting for? What is the ultimate goal? And is it worth the fight? Humanity longs to keep living, and so it assumes that its survival is the ultimate goal. But is the survival of the human race a worthy enough goal that it’s worth fighting for no matter the actions that must be taken to achieve it? Are the survivors of Battlestar really just trying to keep humanity alive, or are they trying to preserve their human values too? Are they trying to survive in a way that’s honourable and worthy? Are they determined that the forces of justice and equality should remain intact even in humanity’s most desperate hour? The power of deontology is that it reflects the belief that some outcomes, even the most worthwhile ones, should not be brought about if we have to give up everything to achieve them: our pride, our conscience, our humanity itself. If we have to become monsters in order to survive, is the ultimate goal still for us to remain alive? Or do we lose the very thing that makes us worth saving?